Many of the curtain fabrics found on the market today are made from synthetic materials such as nylon and polyester. Nylon and polyester curtain fabrics are made from petrochemicals, which are very polluting to the environment and one of the factors contributing to the global warming situation. These curtain fabrics are also non-biodegradable, which means they don't break down easily and so are difficult to dispose of. For example Nylon manufacturing process releases nitrous oxide. Nitrous oxide is a greenhouse gas that is 310 times stronger than carbon dioxide and causes global warming. If possible avoid white fabrics, as this colour indicates that a great deal of bleach was probably used to achieve the effect. Unfortunately most of the dyed curtain fabrics are not eco-friendly. Dyes in most curtain fabrics are not eco-friendly either. Dyes normally used in curtain fabrics contain toxic substances, heavy metals and/or synthetic chemicals. Get a natural look for your curtains by avoiding fabric made from synthetic fibres or synthetic blends. Linen fabric is noted as the fabric of luxury and it symbolizes comfort and elegance. It has a beautiful texture which is at its best as curtains and against the light on the window. It is also possibly the world's oldest fabric! It is antibacterial and antifungal. Linen fabrics do not cause irritation or allergies when used in furnishings, curtains and clothing and they provide protection against UV radiation. Natural linen fabric is also perfect for curtains since it is highly durable. Linen curtains can keep your house warm in the winter and cool in the summer. Linen absorbs moisture but never gives a wet impression. After each wash, linen fabric curtains get stronger and more beautiful. Linen fabric is the first choice for summer clothing. Linen fabrics are also widely used in home in other furnishings, upholstery and bedding. Natural and eco-friendly curtains are made from linen. Linen curtain fabrics are made from flax and need only few chemical fertilisers, and less pesticide than cotton. If pesticides are being used flax needs 5 times less fertilisers and pesticides than cotton to grow. The processes by which the flax plant is transformed into fibre and curtain fabrics are eco-friendly. Artificial fibres such as viscose, bamboo or corn require energy and chemicals whereas flax and linen does not. 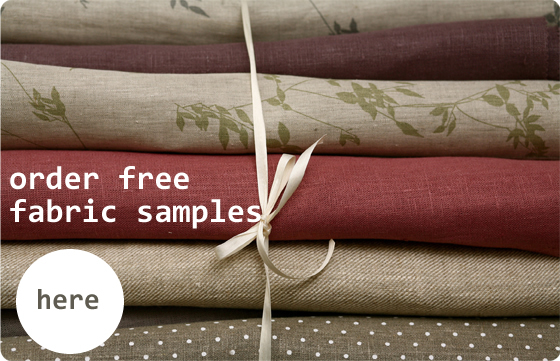 Welcome to Ada & Ina's natural fabric collection!